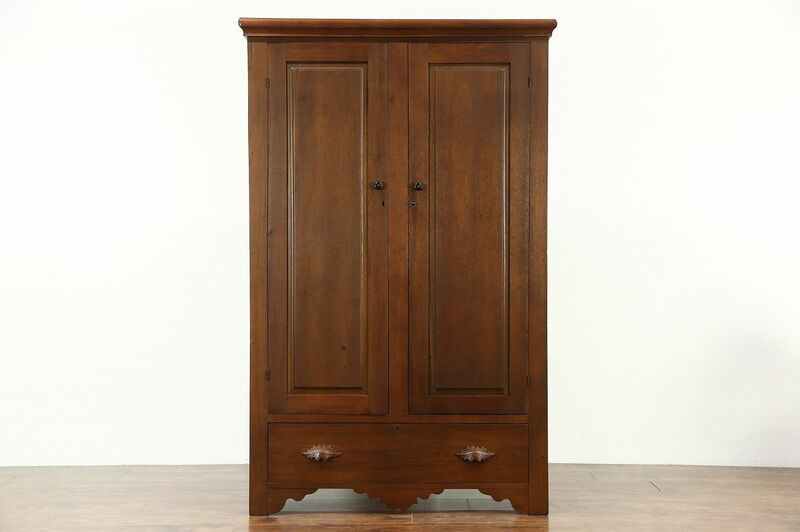 A country armoire, wardrobe or closet was hand crafted of solid walnut in Ohio about 1860. The back is wainscoting, doors have raised panels and sides are single wide planks. The restored satiny finish is in excellent condition, preserving just enough mars at the edges for a little antique character. Inside are iron clothes hooks, shelves or a closet pole could be installed as desired. Interior depth is 17." The wide lower drawer has hand carved pulls and hand cut dovetail joints on this American made furniture. Dimensions are 47" wide, 20" deep and 74" tall.